God is lavish with His Love, magnanimous with His Mercy, perfect with His Peace, jubilant with His Joy, free with His Forgiveness and wildly generous with His Grace. We don’t have to beg for it. We don’t have to worry that it will run short. 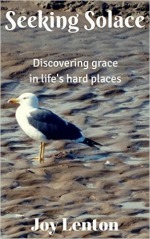 God’s grace is freely available to all of us, all of the time. How good is that?! We can easily become saturated by grace, like a drenching in Holy rain. This is no mere trickle or a small shower. This is more like a flood, a pounding waterfall that roars with power. God’s grace takes, breaks and remakes us. We are washed clean from our sin. We are changed from the inside out. Grace sustains and strengthens, knits together and mends. All that is weak and wounded, flawed and faulty, broken and bent in us is gradually rewired, renewed, restored and refreshed. Why do I call God’s grace wild? Because it’s so indiscriminately and generously given, untameable , out of our control. We don’t have to pass a test or do anything else to be deemed worthy of being washed in God’s grace. All qualify. Period. For all time. In a very real sense, you could say that God’s grace is wasted on us because that’s exactly what it is. Not one of us has done anything to deserve grace. It is literally God’s Riches At Christ’s Expense, bought and paid for at the Cross, poured out freely on us. I love these thoughts on God’s wild grace! I can so easily take it for granted–and yet HE is so wild with it, in the way that He gives it so freely! Again, I want to have my eyes opened more to be aware of His Grace flowing in and around me. There is such beauty in that kind of radical giving, isn’t there? Thank you for encouraging and beautiful words again! Hugs and Love to you! Love the haiku. Grace is such a gift. What a powerful reminder, Joy! Love the concept of Wild Grace! !